Description: NS Southbound Local Freight Train G63 passing through Richwood, Ga. Description: NS Southbound Local Freight Train rumbles through Richwood, Ga. 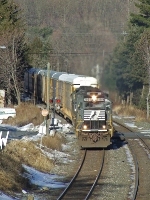 Description: Norfolk Southern stack train 24V is led eastbound through Phillipsburg, NJ by two GP60's. Description: NS 7109 and a sister unit lead 24V east through Phillipsburg. Description: Train 214, powered by one C40-9W and 3 GP60's, approaches the signals at Aycock. Description: 2 yard dogs take a breather at Whitiker Yard. Description: 214 smokes it up at sunrise as he accelerates out of the hole at North Kannapolis after meeting southbound hotshot 203. Description: Three four axle EMD's and a B32-8 power 214 east. Description: A GP50 and GP60 sit amongst the other "in-need" locomotives at the Juniata Facility. Description: GP60's roll by the Kannapolis Amtrak Station with red hot 204. Description: Through the doubletracking construction zone 789, Metuchen Road, 0901 hours. Description: 17th Ave., 0653 hours. Description: NS-P14 waiting in Track-2 for a late Amtrak-19. Description: Higginsville Road, Readington Township, 0745 hours. Description: NS 9295 West with a hot train of trailervans. Description: NS GP60 7109 was dead in tow on today's A48 as NS sets out some tank cars for CSX. Description: NS A48, the Eastbound NS P-Line daily local, pulls into the siding for a meet with the NS 905 Geometry Train in downtown Alexander City, AL.